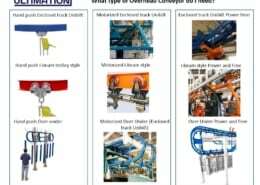 What is an overhead conveyor? Overhead conveyors are what people are generally thinking about when they hear the word “conveyor”. One of the most common types of conveyor, an overhead conveyor is generally used in a production facility to move parts from one location to another. They take advantage of the generally unused vertical space above the working area. Using curved sections or even with elevators, they bring parts down to the level of operators and back up to higher elevations. Overhead conveyors can pass through production areas that humans can’t like through ovens and robot work cells. 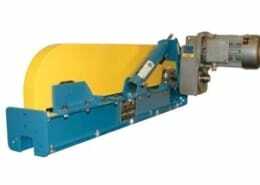 From the days of Jervis B. Webb inventing the modern forged rivetless conveyor chain for the Ford Model T to the present day, Jervis Webb and now their integration partner, Ultimation Industries, have been the leading overhead conveyor manufacturers. 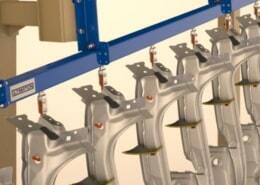 What type of overhead conveyor do I need? Installation orientation – as you’d guess, most overhead conveyor systems are installed in an overhead orientation. But not always. 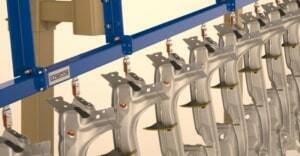 When installed in an inverted (upside down) orientation, these same conveyor components can be used at floor level. For paint finishing systems it can be especially value to use an inverted conveyor system as the risk of dust, dirt or oil dripping from the conveyor onto the parts to be painted is removed. 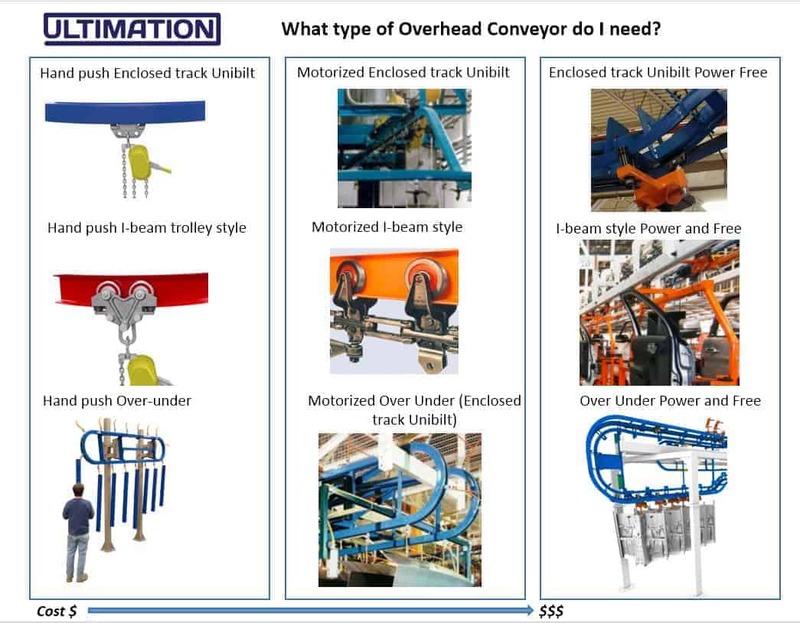 The balance of the content on this page is explaining motorized overhead conveyors (sometimes call monorail conveyors) using both enclosed track and I-beam systems. Unibilt chain runs through the track. 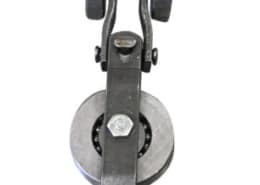 It’s unique configuration with side guide rollers enables very low friction and extremely long life. 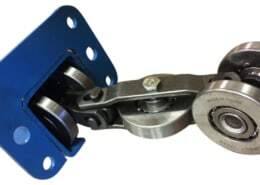 Chain is inserted into the track via a special piece of track which has a hinged opening which can open and close. Finally a take up is added. The purpose of the take up is to tension the chain, so it does not bunch up and so it runs smoothly in the track. 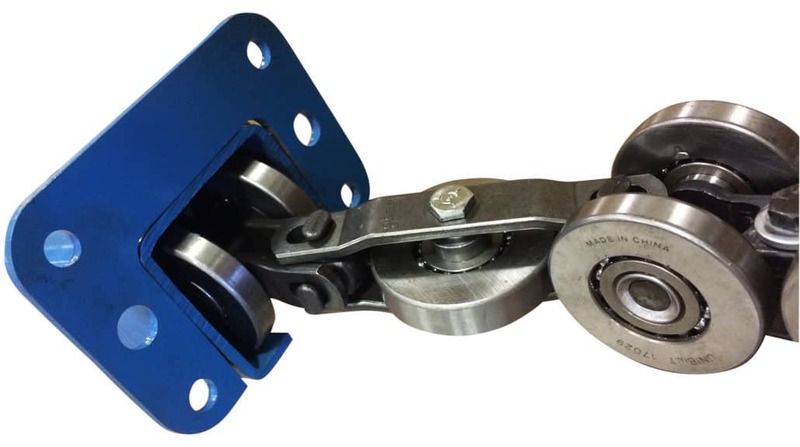 Take ups are typically a curved section of 180 degrees track with a screw or air cylinder pushing the track outward to tension the chain. Design Flexibility: Use of universal link chain makes shorter radius curves and closer spacing of curve tangents possible, accommodating even the tightest of spaces. Improved Work Environments: Enclosed track conveyor design helps prevent external contamination from reaching the chain or track bearing surfaces. Inverted system option also helps to confine dust, grease, and other potential contaminants from getting on the load or carrier, helping to keep both the workplace and product clean. 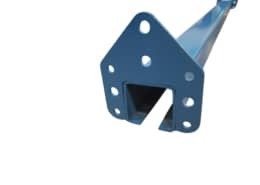 Modular Construction: Patented nested end yoke track connections increase ease of installation and help minimize downtime in the event of layout modification. 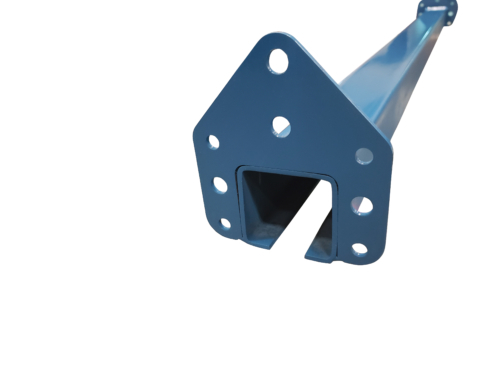 Unibilt track systems should always be bolted or welded to appropriately sized steel support structures. Consult a civil engineer as required to calculate support steel requirements. 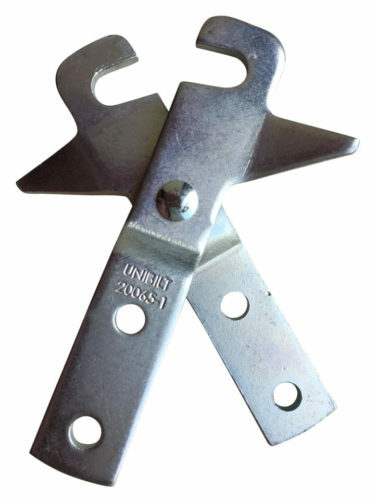 Never bolt or attach Unibilt track to wood support structures. 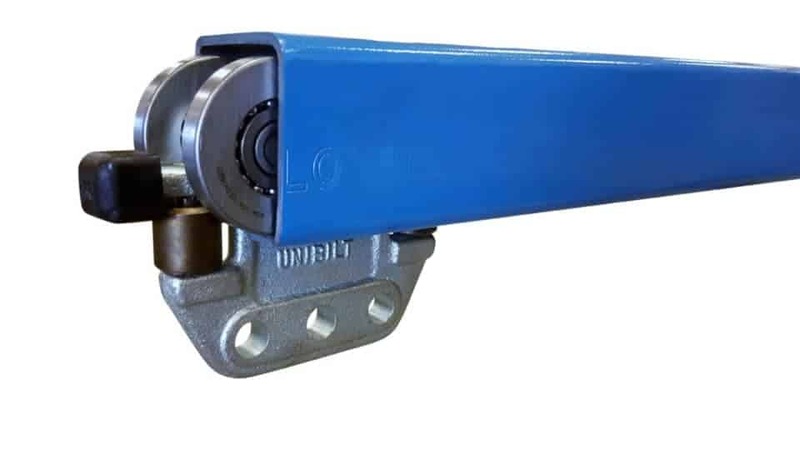 Jervis B. Webb’s rugged line of Unibeam Overhead Trolley Conveyors are the finest quality 3” and 4” I-beam conveyor systems that use a rivetless chain available on the market. Unibeam conveyors are excellent for heavy-duty assembly line operations, manufacturing processing and paint finishing lines. Over 90 years experience goes into every product that Webb manufactures. Unibeam overhead conveyors utilize I-beams for the track rather than the enclosed track used by the Unibilt components. 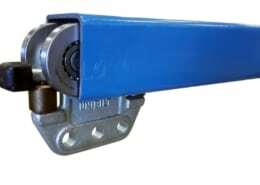 I-beam conveyors are often used for heavier loads as the weight limits per trolley are substantially higher.